Publishing and consuming EDN events can easily be done from a Mediator and a BPEL process. 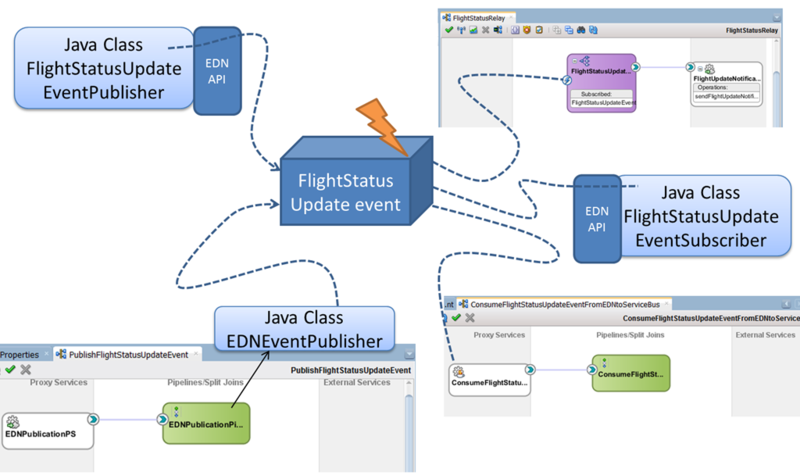 Oracle Event Processor has an adapter to interact with EDN, ADF Business Components can be configured to publish to EDN and anyone capable of communicating over JMS can interact with EDN. This makes it possible to for example publish events to EDN from Service Bus, despite the fact that Service Bus does not understand the EDL file nor has a native EDN integration. In this section we will first look at the interaction from a simple Java Client with the Event Delivery Network. Next, we will focus specifically on Service Bus as consumer and producer of events. The sources for the final situation for this section are found in folder EDNandAlternativeChannels.